Are you searching for How to solve write protected error in Pendrive? Well, You are right to spot. In this post, I will guide you on how to fix/disable write protected error in USB removal disk. I have also faced this problem. Actually, I have purchased a Sandisk pen drive and transferring data from my PC. My friend plugs out pen drive while transferring. Ohhh…!! Now I was getting the problem “ SanDisk pen drive write protected error ” while transferring data. I was searching How to solve Write protected error but there was not much-satisfied answer about how to solve this. After searching a lot Now I have fixed this error. So today I am going to share how to fix or disable write protected error in Sandisk Pen drive. Why Pendrive show Write Protected error? #1. How to Disable Write Protected Error using Formatting pen drive? #2. How to Fix Write Protected error using Antivirus? #3. How to Solve Write Protected error by User Account Settings? #4. How to Fix Write Protected by Registry Editor? #5. How to fix Write Protected error using Command Prompt? Write Protected error may appear because of a software error. Pendrive Physical damage may be the reason for this error. Or, Pendrive got infected with Virus. Below are the five best method and ways to fix pen drive write protected error. This method will be helpful if you want to get ride of Protected error in Sandisk Pendrive. I have tried this method in many pen drive but it works in some pen drive. So I suggest you format your pen drive. If there are some important things then you should try Recover deleted files from Pendrive (Follow the second method of recovery guide ). How to Format Write Protected Pendrive? This method will work if your pen drive is infected with a Virus. Yes, Virus attack may be cause for write protected error. So firstly I advise you to scan your Pendrive/Removal disk with Best Antivirus Software for PC or If this problem occurs in your SD Card then you can use Best Antivirus App to remove Write Protected error. Let’s see the 3rd way if this method not works. Ya really, You can solve this error using User account setting. 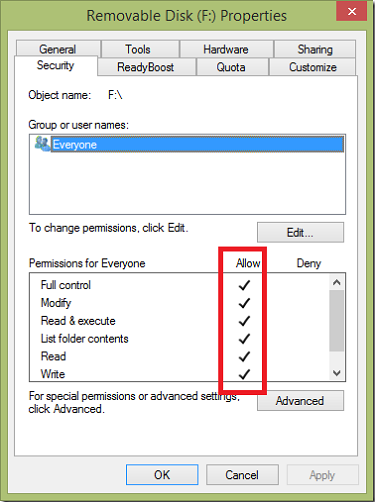 In user account settings, There is some permission not enabled So this may cause a protected error. Here you have to enable some options to get rid of this problem. Go to My Computer Section >> Right Click on Pendrive >> Then Hit on Properties. Select the Security Tab and enable all features by Allowing all Option. There is must check Allow on Write Option. It will solve the write-protected error. I hope this method works. If not then Check another way to disable Write Protected error. If Above all method not worked then you should try this method it will surely remove write protected error. This is the best method for fixing protected pen drive using the registry editor. Follow below process to fix write protected error using the registry editor. Firstly Click on Windows Button, type Run in the search box and Hit on Run Program or directly press Windows button + R to open the Run box. Write REGEDIT in it and hit OK.
And change the value from 1 to 0 and then OK.
Eject Pendrive and restart your system. Now your pen drive is fixed with write protected error. This is one of the best methods to fix write protect error. This is an alternative method of #4 Way. If the above process does not work for you then do the last way to fix the protected error by cmd. Click Windows Button + R and type CMD and hit OK. Type DISKPART and Click on Enter button. Type ATTRIBUTES DISK CLEAR READ ONLY and Hit Enter. Now your USB is fixed with Write Protected. These are the best ways to fix write protected error from Pen Drive. #3 and #4 Works great for solving Write protected in Pen drive (It may be HP, Sandisk, Strontium, Sony, Samsung). I hope you have solved this issue If not then please Comment below and like our facebook fan page to get the latest update. Thank you for the useful tricks to fix pen drives.